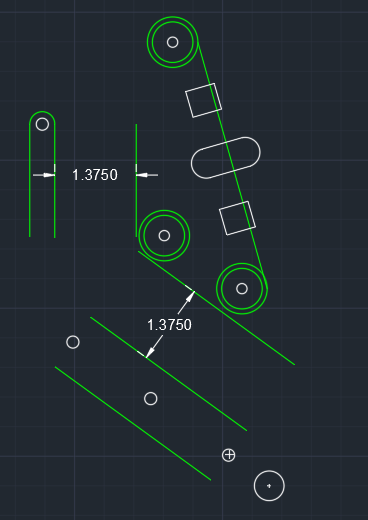 I'm at the stage of drawing out the playfield in CAD to use as a drill template and I'm working on the in/out lanes and slings and I can't shake the feeling that something feels off. I added some guidelines to represent the size of the plastic that separates the outlane from the inlane, they're in green. I also tried to show the outline of the star posts on the slingshot and the rubber, also in green. I'm aiming for 1-3/8" as the width of the lanes, as shown. What's looking odd to me is the top of the sling being so much higher than the start of the in/outlanes. I've looked at pictures of "real" games and it seems like it can go both ways with the slings being even or higher than the in/outlanes. In my picture, the top of the in/outlane is 1-3/5" lower than the top of the sling. Does that seem right? I took the slingshot post spacing from the pinballmakers website in the "Williams Playfield" drawing they have. I don't trust it much though because when I opened it in AutoCAD all of the dimensions seemed off (for example the playfield width was 20.2484" instead of the 20.25" it should be. Everything seems shrunk by that little bit. Looks fine to me. If you want the gap smaller, make the inland guide longer. Like you said, games had every level of inlane post. Usually the plastic isn't exposed, there's a mini post above it at varying heights depending on the game. When in doubt, measure your inlane plastic/etc before you go cutting.